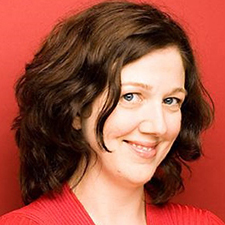 Canadian collaborative pianist Amanda Johnston gives presentations on "English and German: A Comparative Approach" and "French Diction: A Refresher for Professionals" at the 2019 NATS Summer Workshop, sponsored by the RCM Certificate Program. Canadian collaborative pianist Amanda Johnston is one of the featured presenters at the NATS 2019 Summer Workshop, sponsored by the RCM Certificate Program. Amanda has provided an overview of what to expect from her sessions. We invite you to take part and gain new skills at this unique event. and the other workshop presenters. Can you fill us in on some of the key takeaways from your presentations? Both of my presentations will be in the format of a "Lecture and Masterclass." I believe that the study of lyric diction is inseparable from performance. Far beyond the memorization of pronunciation rules, diction has the power to communicate the wishes of both the poet and the composer. Each of my sessions will outline advanced concepts typically not covered in introductory courses, followed by a masterclass demonstration illustrating the effect of healthy diction on the singing tone. The German schwa as "vocalic chameleon": a deconstruction of the schwa and its importance in both stress and "unstress"
If I’m a lyric diction teacher, what sort of new perspectives will I gain, so that I could say I was really glad I took part in the workshop. My approach to teaching diction is comparative in nature. I believe that related languages should be studied, practiced, and even programmed together. No language exists in a vacuum. 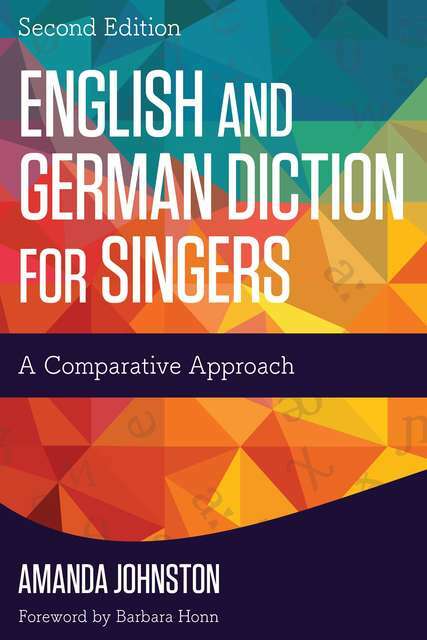 Too often, singers are preoccupied with rules for each language as learned in a consecutive manner, not realizing that, in fact, many commonalities exist across Germanic or Romance languages. For example, allophones of K are identical in German and English; for, the point of articulation of the [k] in "cold" and Kunst is different from that in "key" and Kind. 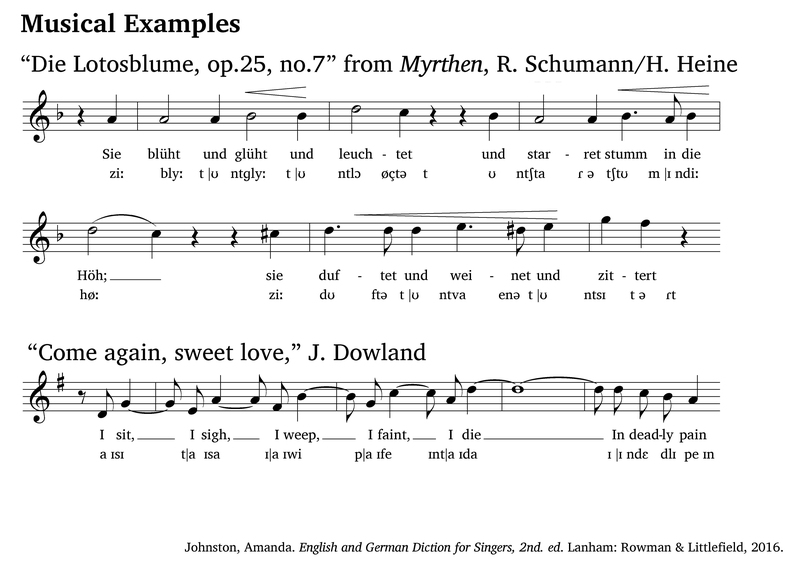 Recognizing such similarities allows singers to learn more about their own language while removing the unfounded fear of German. I specialize in the efficient production of phonemes integral to achieving a native accent. In both sessions, participants will learn tips to mastering tricky sounds that they may have been singing incorrectly for years—for example, the curly-tail J, the ich-laut, the ach-laut, the German Upsilon and extended Epsilon. Moreover, natural cadence and syntax are often unintentionally disturbed by the treatment of incidental, monosyllabic words in both languages. Comparisons will be drawn using techniques such as implosion/explosion and vowel reduction. Are there any fond recollections that led you to become a specialist in the field of teaching diction? I first encountered IPA in Kindergarten in Cornwall, Ontario. We played many games in French and each had a small cahier that we used to write down one symbol each week. Growing up, I associated IPA solely with French not knowing of its broader uses. Upon moving to Germany to attend graduate school, I would mentally IPA conversations with people in real time, often incorrectly transcribing at first. I will never forget the spelling for Haarbürste (hair brush), after mistakenly asking a salesperson for a Haarbrüste (roughly translated as "hairy chest")! Her boisterous laughter will ring in my ears forevermore. How would you relate your specialization in collaborative piano with the teaching of diction? There are many possible careers as a collaborative pianist and countless specialties. 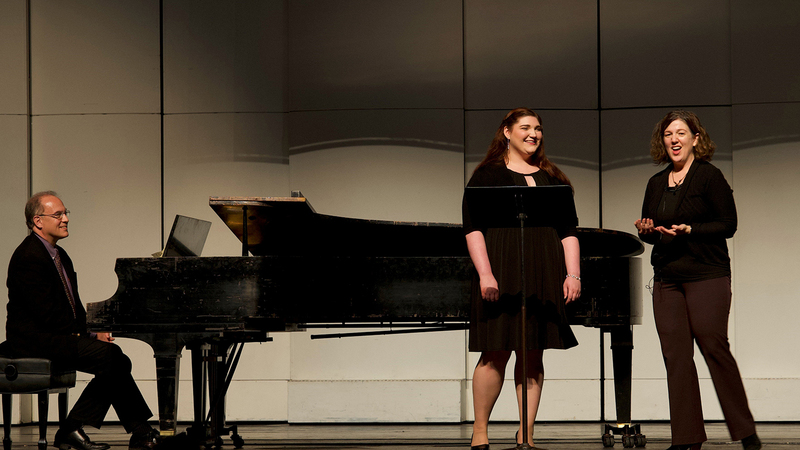 Singers often work with different coaches when preparing either a recital program or an opera role. Coaches can specialize in a certain genre, language, or style. Sometimes a specialty develops due to chance or need, e.g., the trombone studio needs a pianist to work regularly in lessons, or due to interest. I started out playing for instrumentalists during my undergraduate degree and it was not until my fourth year that I began to work with singers. It was immediately clear that this was where I wanted to put all of my energy, as the combination of music, poetry, and foreign language provided the ultimate fulfillment. The human voice also moves me far more than any other instrument. I enjoy that the vocal repertoire is vast and endless. I am constantly encountering new songs and arias and am intrigued by how art songs are completely different pieces in various keys according to voice type. Foreign languages take years to be fully mastered; likewise, diction prowess. As a coach, one needs to be able to think in all of the major languages and be well-versed in each language’s color palette, rules, and challenges. If a collaborative pianist is interested in specializing in vocal music, I always suggest that language study, as well as diction, commence immediately. How is the subject matter relevant to those who teach in an independent studio? It can be a challenge to sufficiently provide diction to private students who do not have the benefit of a structured university class. I will have handouts to distribute for both presentations that will summarize the main points. My book is designed to work well for self-learners and it includes introductory chapters for those not yet fluent in IPA. Included with the purchase is a comprehensive downloadable workbook, which provides exercises chapter by chapter for the independent learner. All voice instructors may request a free Answer Key. Private teachers may assign exercises at the end of a voice lesson, depending on what each student needs to practice. In addition, I have a video series. Short clips illustrate both visually and aurally how to properly execute challenging phonemes. There are also videos that simply go through the oral drills included in the book. This is particularly valuable to singers and teachers in an independent studio. In the privacy of one's own home, the singer can speak along with me and see close-up tongue positions while imitating the correct pronunciation. Would any of the subject matter relate to teaching CCM? One of the things that attracts me to diction is that it is not absolute. Languages are in a constant state of flux, and therefore, so is the field of lyric diction. In my book, I compare and contrast English diction choices depending on the specific repertoire and genre. For example, in music theater, a singer might choose to employ more R-colored vowels and solely use the retroflex R [ɹ], as opposed to a flipped or rolled R. Idiomatic pronunciation is integral to all genres, but in particular, CCM must employ a level of language that is relatable. Are there other thoughts you’d like to add about the workshop? I am so looking forward to being part of the NATS Summer Workshop! It will be exciting to meet new colleagues and students from across the nation, all united by their interest in diction. 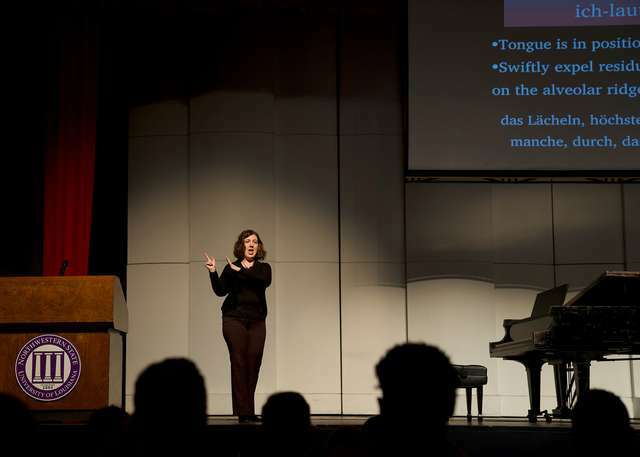 Pictures from Amanda Johnston's Lecture and Masterclass on German Diction at Southern Region NATS Conference in November 2018 (Northwestern State University); and musical examples from "English and German Diction for Singers," illustrating how IPA may be lined up rhythmically to better reflect when phonemes are produced. CLICK HERE for more about the 2019 NATS Summer Workshop, sponsored by the Royal Conservatory of Music (RCM) Certificate Program.